Real Madrid president Florentino Perez believes that goalkeeper Iker Casillas is one of the greatest captains to ever wear the club’s jersey. The Spain international has appeared 472 times for the capital outfit since making his professional debut in 1999, helping them to win five La Liga titles and two Champions League trophies in the process. At a charity event organised jointly by the BBVA, the Real Madrid foundation and Casillas, the club’s chief hailed the achievements of the 31-year-old. 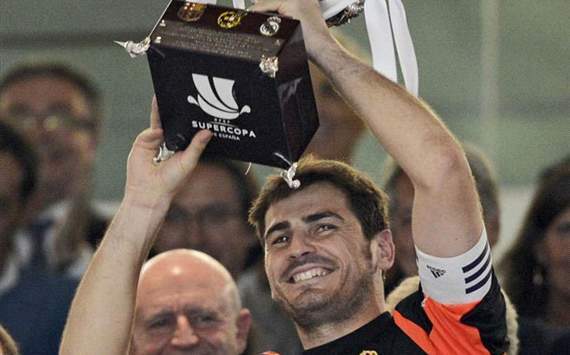 “Iker Casillas is a Real Madrid and Spain legend – one of the great captains of the club’s history,” Perez told AS. “He has shown that, as well as enjoying sporting success, he can take on board the success of the club.